Provide comfort for the family of William Richards with a meaningful gesture of sympathy. 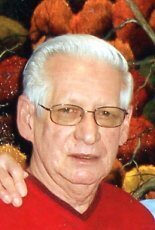 EAST LIVERPOOL – William G. Richards, of East Liverpool, passed away Tuesday, December 25, 2018 at the Calcutta Health Care Center. He was 86. Born in East Liverpool, May 4, 1932, he was a son of the late J. Roy and Lillian Gaskill Richards. A lifetime area resident, he worked as an account supervisor for Columbia Gas until retiring in 1994. A member of the East Liverpool High School Class of 1950, he also held membership in the Elks Lodge 258 and the Pittsburgh Chapter of the American Guild of Organists. Bill was a Korean War Veteran of the U.S. Army. A member of the Good Shepherd United Methodist Church, since 1990 he had been the organist at St. Stephens Episcopal Church. Previously, he was the organist at the former Calvary United Methodist Church. Bill loved spending time with his dog and two cats. He is survived by his wife, Elaine Craven Richards. The couple married September 11, 2004. There are five step-children: Frank Chronister of California, Debbie Armstrong and her husband, Ace Armstrong, of Florida, Stephen Chronister of Lisbon, Mike Chronister and his wife, Lisa, of East Liverpool, and Anthony Chronister of Florida, as well as four step-grandchildren. A brother also survives, Earl L. Richards and his wife, Elizabeth, of Michigan, along with three special nieces. Friends may visit Friday evening at the Dawson Funeral Home where the family will be present from 6 to 8 pm. Rev. William Pugliese will conduct a funeral service at 11:00 a.m. Saturday at the funeral home. Burial will be at Spring Grove Cemetery. To send flowers to the family of William G. Richards, please visit our Heartfelt Sympathies Store. Provide comfort for the family of William G. Richards by sending flowers. Rest In Peace Uncle Bill. Aunt Elaine our thoughts and prayers are with you and your family. Love Dave, Laura, David and Ryan Hahn.